On a stifling summer's day, eleven-year-old Jack and his two sisters sit in their broken-down car, waiting for their mother to come back and rescue them. Jack's in charge, she said. I won't be long. But she doesn't come back. She never comes back. And life as the children know it is changed for ever. Three years later, mum-to-be Catherine wakes to find a knife beside her bed, and a note that says: I could have killed you. Meanwhile Jack is still in charge - of his sisters, of supporting them all, of making sure nobody knows they're alone in the house, and - quite suddenly - of finding out the truth about what happened to his mother. But the truth can be a dangerous thing . . .
Belinda Bauer is a powerhouse of British crime writing, one of those top-class authors whose lesser books are still the envy of many of her peers. She writes very human characters with acute insight, a range of people who are impacted by crime in a variety of ways. Her books feel very fresh, and real. She announced her presence several years ago with the brilliant debut BLACKLANDS, a searing book set near the Welsh borders, featuring an adolescent boy who gets into a cat-and-mouse game with an imprisoned serial killer; the boy desperately trying to mend his broken family. You'd have to go a long way to find a better crime debut than that from the past decade. Three years later Jack is running their household, their distraught father having never recovered. Newspapers are piled everywhere, the kids home school themselves, and no one knows they're living without parents. 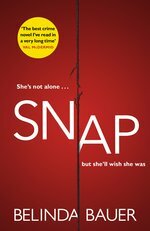 Meanwhile pregnant Catherine is being left creepy messages and doesn’t want to let her partner know, a 'Goldilocks' burglar is on a crime spree in smalltown Devonshire, and local detective Reynolds struggles to cope with the arrival of grouchy new superior, DCI Marvel. Marvel has been exiled from London, hates the countryside, and misses the action of the city. SNAP is full of strands and a disparate cast, but Bauer brings it all together beautifully, like a master puppeteer or gleeful conductor. This is tale that's both harrowing and humorous, that's full of life and energy. It fair fizzes from start to finish, delivering and delighting on multiple levels. I enjoyed her most recent crime novel, THE BEAUTIFUL DEAD, but that was more of a very, very good version of the somewhat familiar 'obsessed and artistic serial killer' trope. SNAP shows Bauer in full flight, full of creativity and class. Crime writing of the highest order, from a true maestro of the craft. Craig Sisterson is a lawyer turned features writer. He’s interviewed hundreds of crime writers and talked about the genre on national radio, top podcasts, and onstage at books festivals on three continents. He's been a judge of the Ned Kelly Awards, the McIlvanney Prize, and is founder of the Ngaio Marsh Awards. You can heckle him on Twitter.